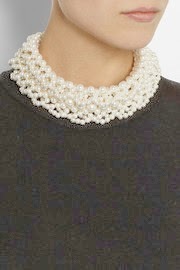 How to wear pearls? 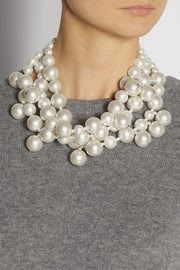 Recently I have noticed a few pearl necklaces that have caught my attention. 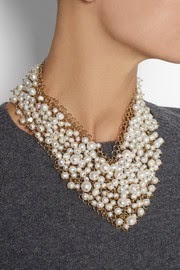 A very grande, statement necklaces not just a measly string of pearls! No offence to my Tiffany's string of pearls! These ones are so amazing that will 'make' the entire outfit. Perfect with a simple black dress for the evening or a simple white shirt for a day time business meeting. 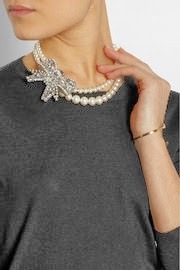 Or even putting it on after a business meeting for an evening date to add more drama and glamour to the outfit. Something a simple string of pearls can't do! Miu Miu here -my favourite!